This year, it’s time to replace the old boring Christmas tree decorations you use every year. Red, gold, and green shimmering ornaments are great and all, but you’ve been there, done that, and I am sure your festive tree needs a bit of refreshing. 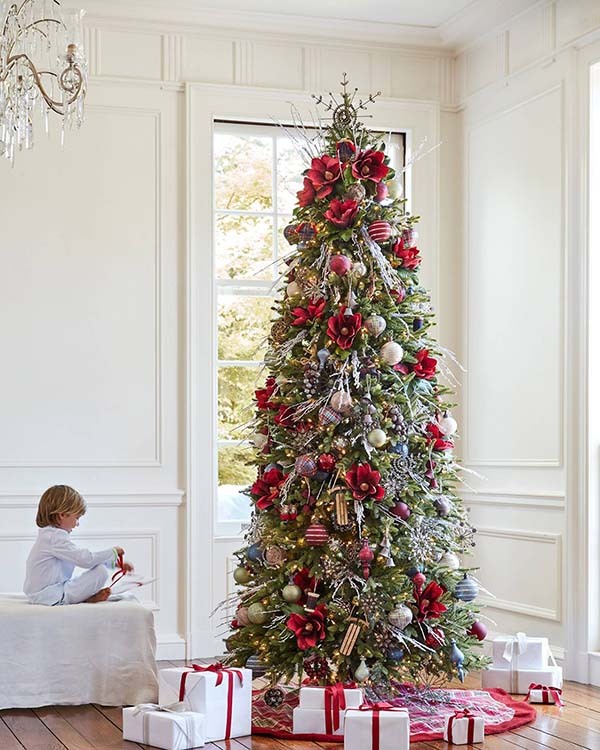 Let these incredibly chic 23 Christmas trees inspire you — whether you want understated, rustic, glam, cheerful, there is a Christmas tree decor for you on this list. 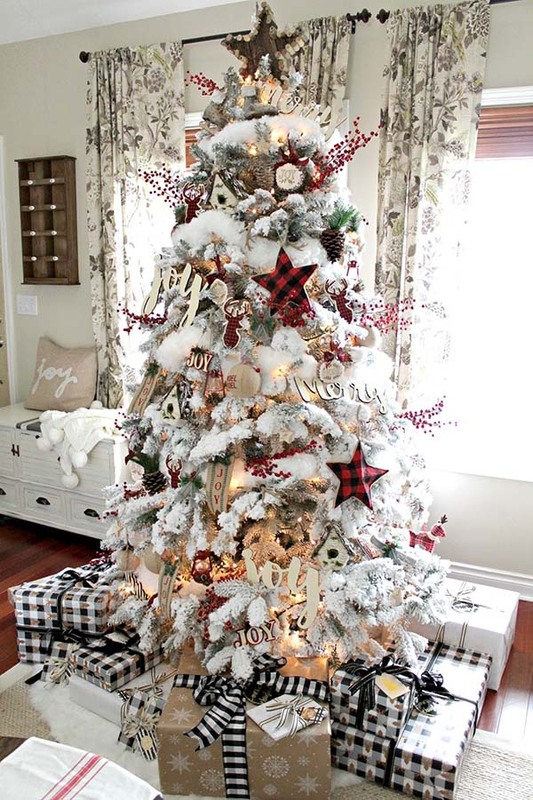 This insanely beautiful Christmas tree is made by the blogger Joanna Rooney and it feels a lot like a country Christmas thanks to the red, green, white, plaids, faux fur, and the natural elements. There is a bunch of artificial cranberries tucked enfolded in the tree. It’s a nice joyful touch, isn’t it? 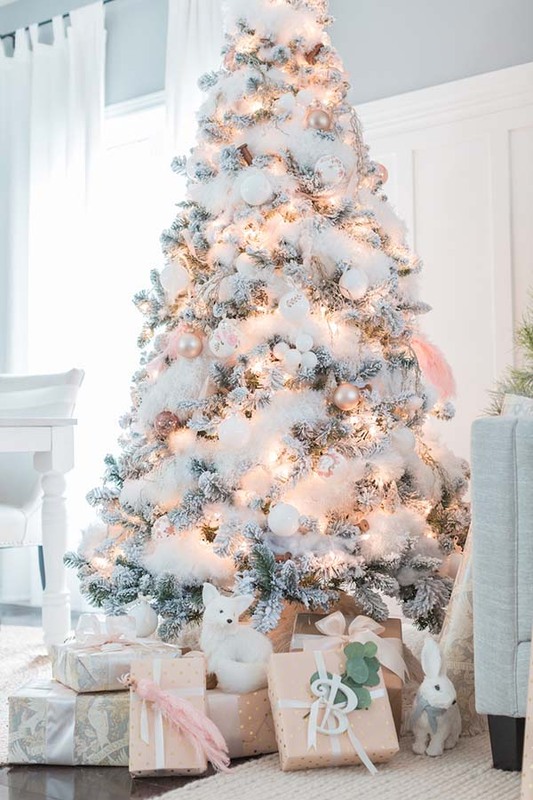 You know what, why don’t you skip the tree full of shiny colorful ornaments and go for a simple frosted white tree with a garland and silver figures instead? 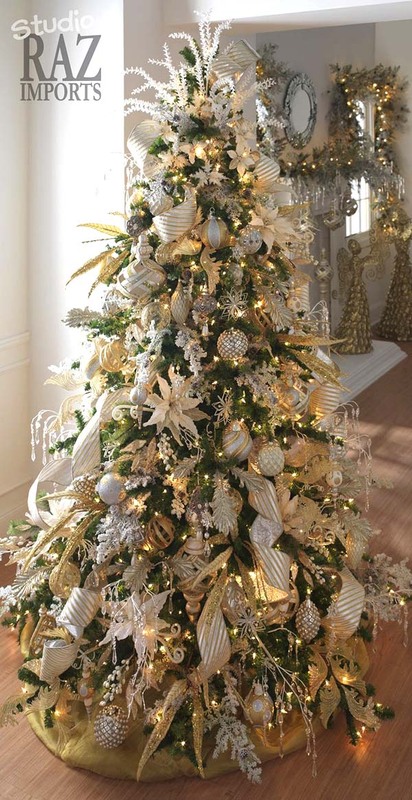 It is one of the most elegant and dazzling Christmas tree ideas I’ve seen so far! The red-green theme for Christmas? Again?! Not even close to avant-garde. 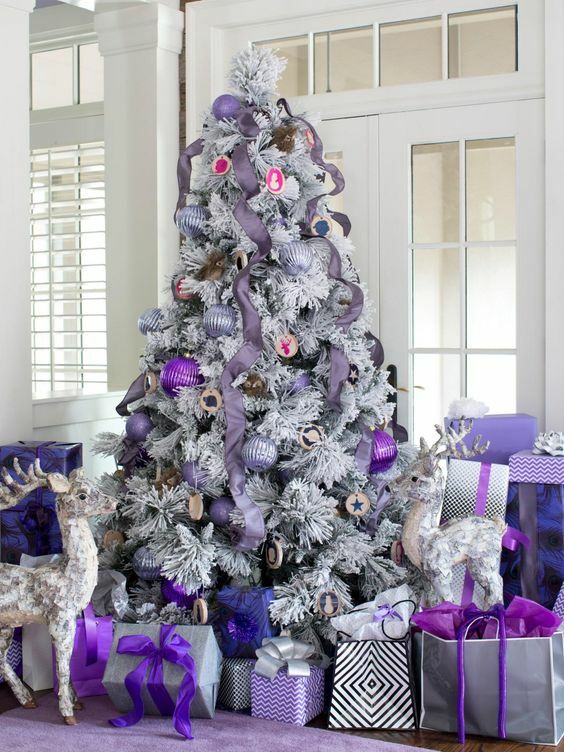 Switch it up with purple garlands and ornaments this year. It will surely grab everyone’s attention to your festive dinner party. 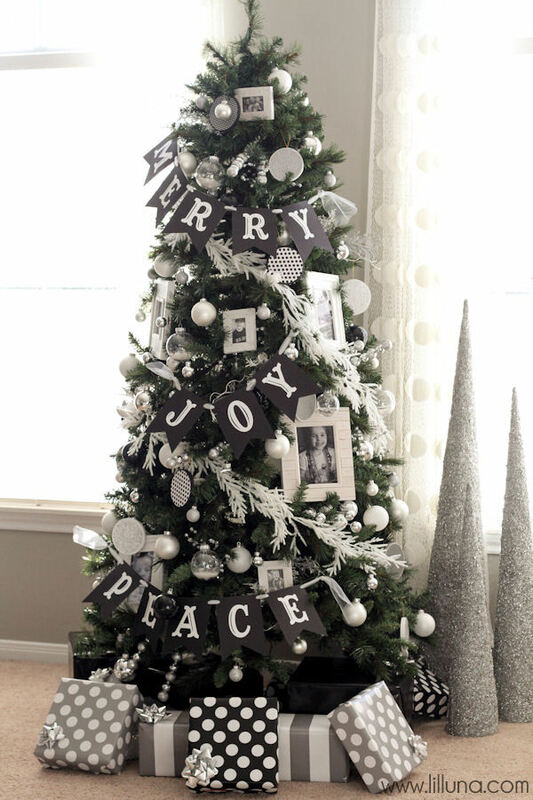 This white frosted Christmas tree has tons of mix possibilities. For instance, you can display some baby pink or rose gold ornaments (as shown in the picture above) for a girly innocent vibe. Also, what do you think about the figures displayed around the tree? Cute, eh? 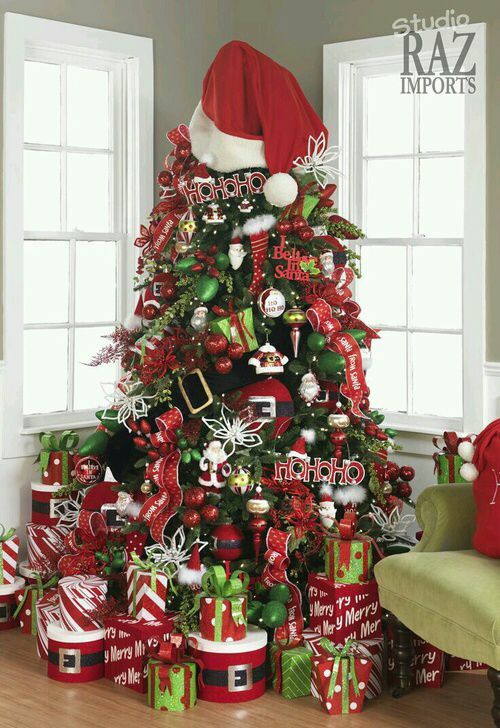 Here is another super cool idea on how to decorate a Christmas tree that catches everyone’s eyes. 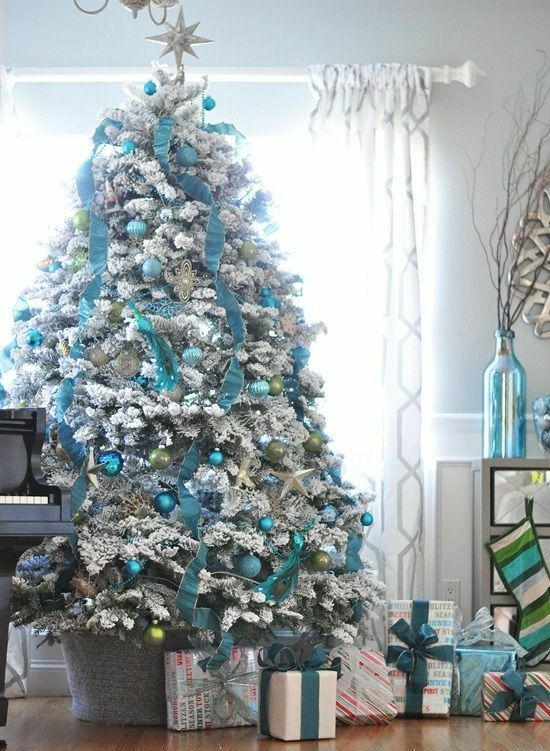 Instead of decorating the festive tree in the traditional red-green palette, try mixing in pops of turquoise for a glacial effect. When choosing Christmas tree ideas, never be ashamed of going for all glitter to make a strong statement. 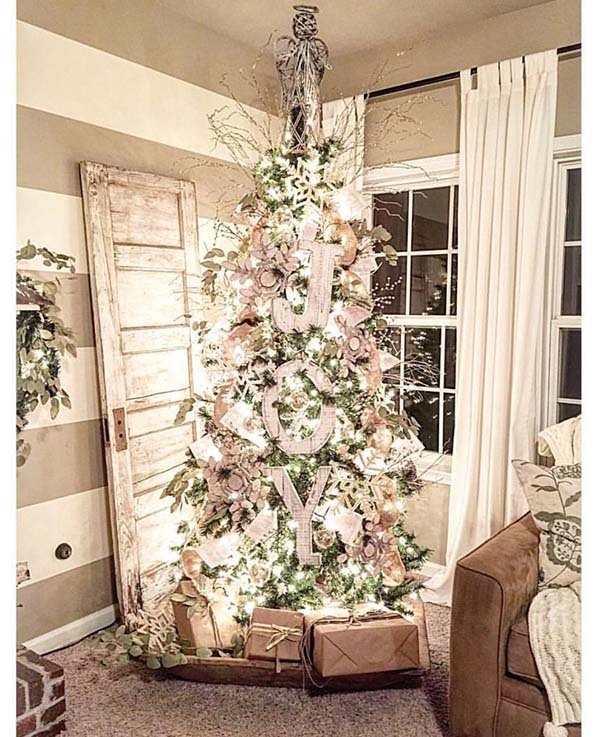 To re-create this incredibly stunning vintage style pink and gold Christmas tree, you will need to pick up some faux floral elements. 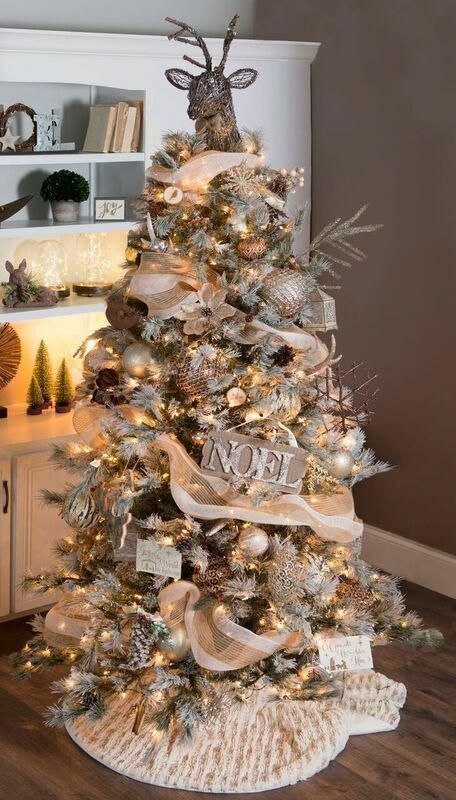 They are combining so well with the frosted branches and create something elegant and very sophisticated. The tree topper is probably the first thing you see when entering a room around Christmas time. 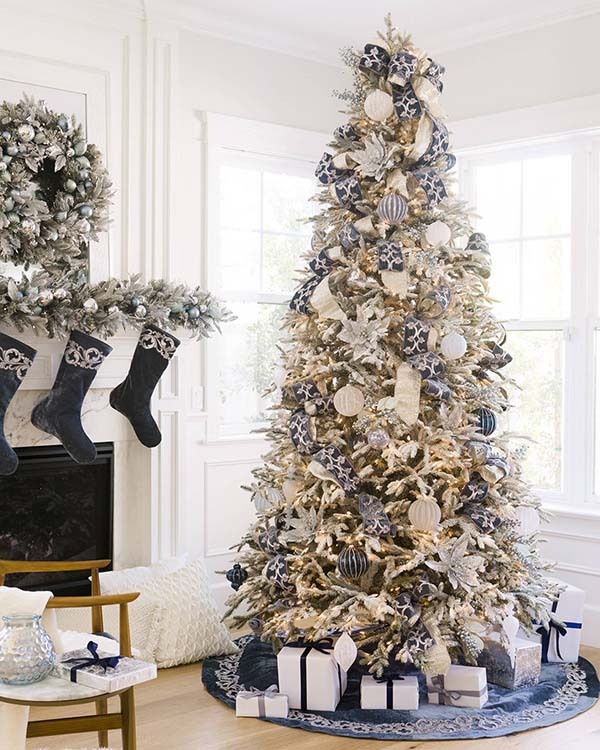 This all-white Christmas tree decorated with navy blue and gold ball ornaments is one of my favorite holiday decoration themes ever. The blue color gives an icy touch while the gold adds more glamour. And how doesn’t love glamour? 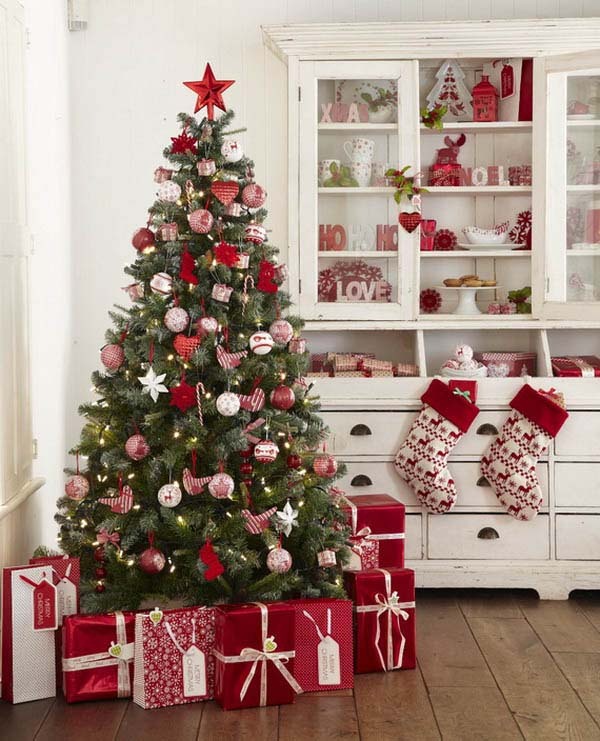 Here is a joyful Christmas tree decorated in red and white. The decoration looks very traditional and organic and yet elegant. Keep it simple and add a few sprigs of red berries and a bunch of pinecones from the nearest park. When there is loads of greenery around, hues of lime and mint feel like a breath of fresh air compared to the traditional red and blue Christmas colors. However, some of you might think it’s a bold decision, skip the shimmering Star Christmas tree topper for a more organic look. I am a big fan of the small Christmas trees that are well-customized to show the family’s taste and spirit. For instance, when you’re done with the decoration, why don’t you hang a banner JOY on your tree to spread the joy and love. If you want to make a strong statement and catch your guests’ eyes, do not just settle on one color scheme — you’ve got the whole rainbow to work with. It is so cheerful and extraordinary without losing the traditional feel. I love it! 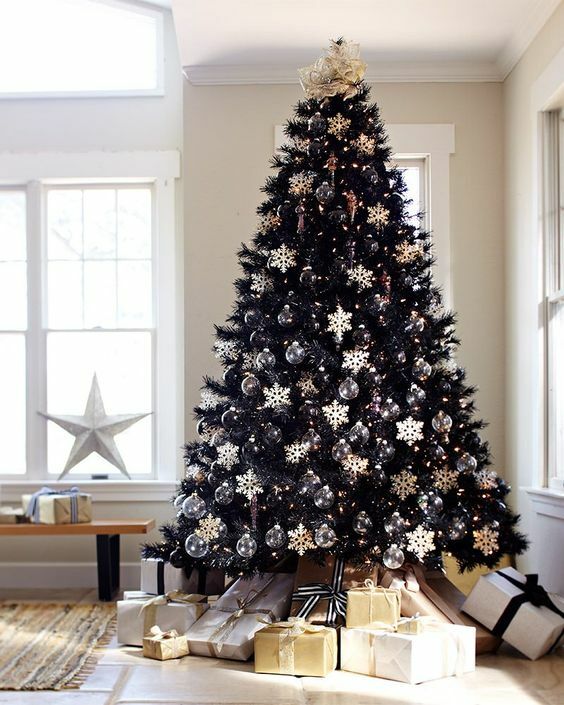 This large black festive tree has it all – elegance, texture, and glam thanks to the golden ornaments. The best thing is that this tree turns into the living room centerpiece itself. Tastefully adding some shimmering elements and understated lights would just reinforce its glam. 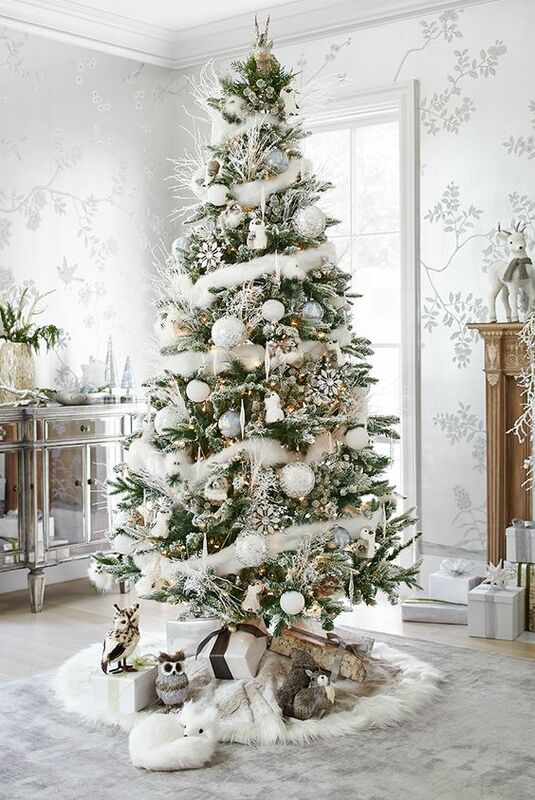 For an understated tree that’s still fiercely elegant, use muted colors to complement your faux frosted evergreen. 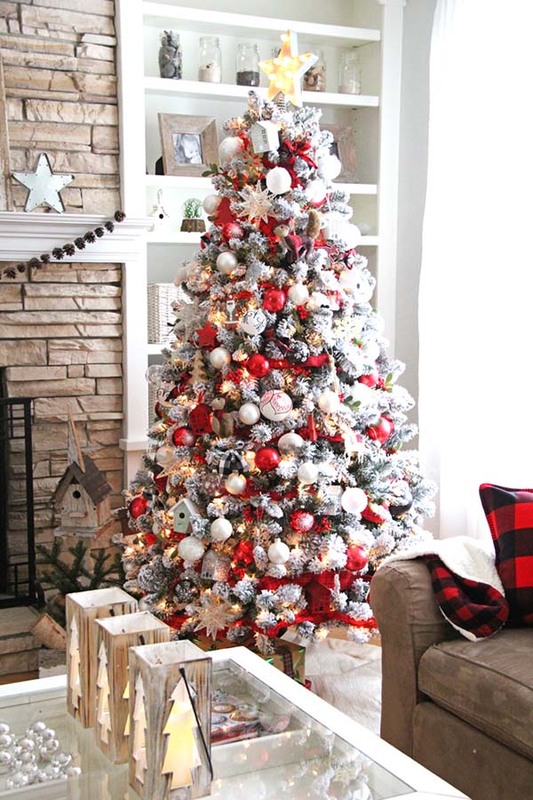 Besides, it is a cool idea to display the Christmas tree close to the windows because the natural light will make the ornaments look more glowing and festive. 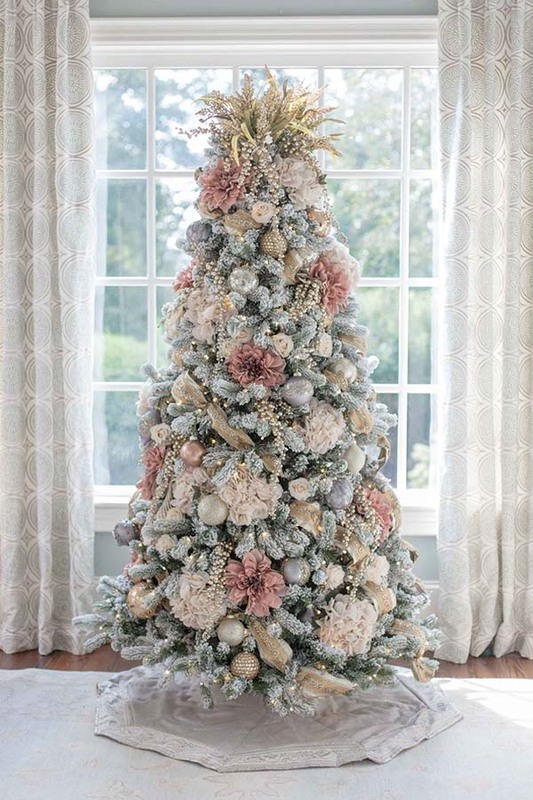 A floral Christmas tree is an unexpected but captivating spin on traditional winter decor, especially if your walls are painted in pale colors. Stick to the traditions and blend in faux red gardenias right in the evergreens. 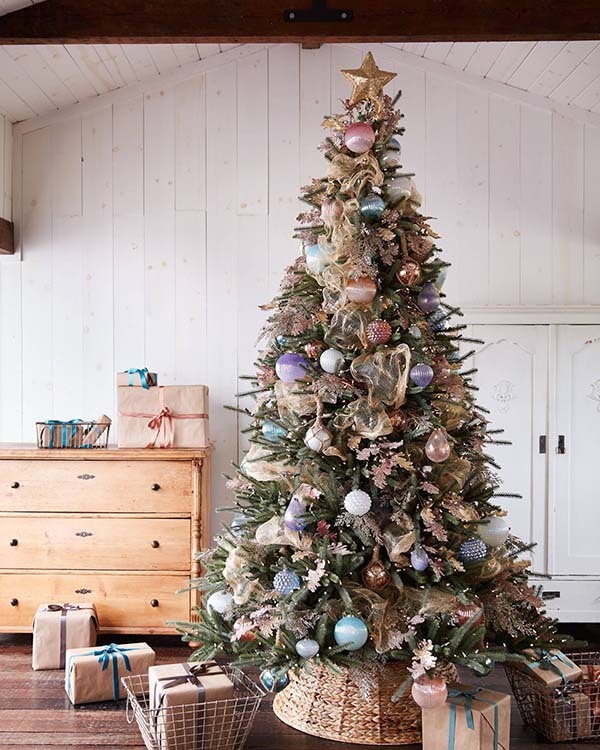 Go for sophisticated rustic with this insanely chic Christmas tree, which features muted white, purple and blue ball ornaments delicate ivory ribbon, and string lights. The Christmas tree decor ideally fits with the wrapping of the presents around. The first time I saw this project for a Christmas tree decor, I thought it’s a hot mess. However, I kept staring at it and started seeing how amazingly joyful and fun it is. It is a cute combination of different colors, shapes, wooden signs, materials, and I simply adore it! From all the Christmas tree ideas I’ve found on the internet, this one is my kids’ favorite one! It is basically a fun transformation of the tree into Santa Claus. Instead of the good old Star tree topper, put a hat this time. Instead of shimmering garland, put the Santa’s belt (you can find in every dollar store). In case you suffer from an insignificant obsession with bunting banners, this Christmas tree decor might be your game! These ones are made of black cardstock and White vinyl letters (chalk paint optional). It doesn’t get more timeless than a Christmas tree trimmed with a mid-sized star topper, a bunch of candy canes, and loads of classic red and white ornaments. Sometimes simple—like this (almost) naked Christmas tree—works best, especially if you’re planning to feature a tree in a spacious living rooms space with tons of other showy holiday decorations. However, I’d recommend adding a small Christmas tree topper in some muted color for a finishing touch. 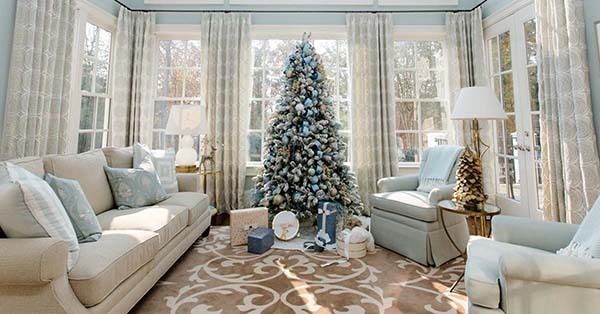 While some snowy decorations can feel a bit too cold or severe, this enormous Christmas tree decor in warm blue feels welcoming and brings some additional warmth to the room thanks to its muted tones and vintage ball ornaments. It’s surely the focal point of this spacious living room. No matter if you decide to give your Christmas tree some rustic flair, a modernistic gold look, or just decide to stick to the red-green traditions, make sure you find a way to express your personal style and taste.